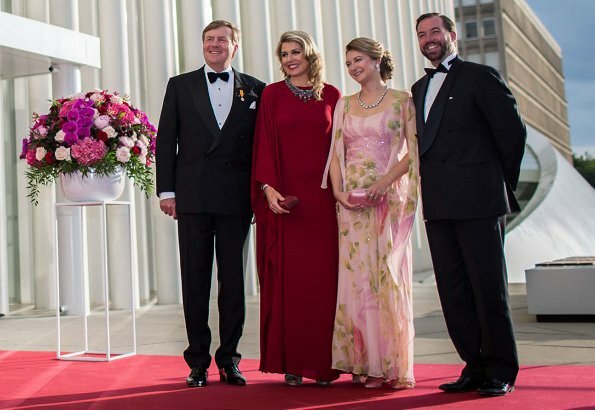 On the second day of their state visit to Luxembourg, King Willem-Alexander and Queen Máxima hosted a concert and a reception for the Grand Ducal Family. 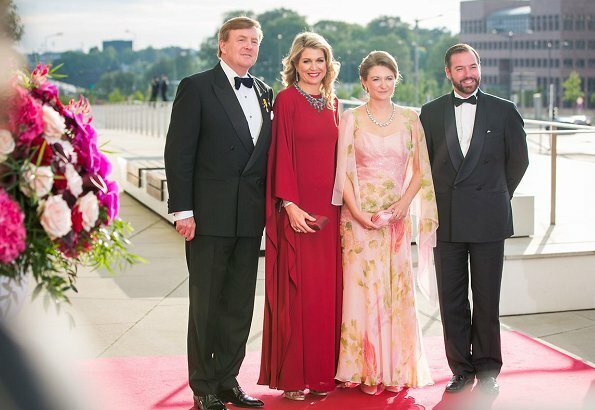 Grand Duke Henri and Grand Duchess Maria Teresa, Hereditary Grand Duke Guillaume and Hereditary Grand Duchess Stephanie attended the concert held at Philharmonie concert hall in Kirchberg district of Luxembourg. 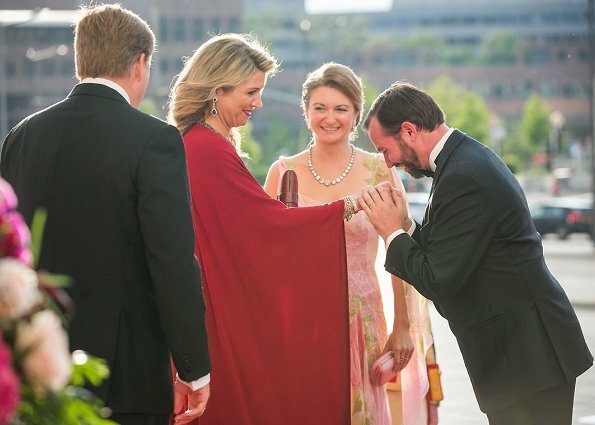 Ik herinner me nog de opmerking van Maria Teresa over haar schoonmoeder Groothertogin Josephine Charlotte, geboren Prinses van België. "Mijn schoonmoeder haat me". 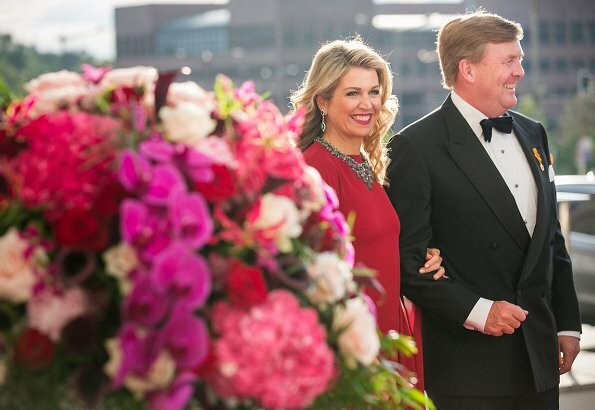 En haar schoondochter mag haar afdankertjes dragen! En wie zegt dat ze hier niet vrijwillig voor kiest? Once again Stephanie is wearing MTs clothes from 14 yrs ago. Why? The soft colors look nice on her. I really don't understand either Diane. As stated time and time again..Stephanie has money to hire a proper stylist. All she has to do is wear whatever is purchased for her,but she doesn't even want to do that. Borrowing decades old dresses from your 62 year old mother-in-law is ridiculous. It's just pure laziness. In this case I must say, it was worth recycling the dress. The rose and green of the dress suit her much better than MT, she looks lovely in it. It would have needed another hairstyle and necklace to make it look fresh and modern. While it didn' suit MT in the old picture at all, not her style. It made me laugh, with the heavy make-up, suntan, heavy too dark jewelry and backcombed hair she looked like the wannabe prom queen of the year :-)))) I much prefer her style of today. this haircut makes her look younger than fourteen years ago and the green dress with matching earrings is gorgeous. I love it and enjoy MT outfits lately very much. She nails it every single time. Why not really? I think MT has better eye for clothes than Stephanie has and after all these cloths she is borrowing are mostly divine couture Elie Saabs. I think she should borrow even more and look more fab really. Why buy new when you can wear vintage and reuse your mother in laws dresses! Stephanie looks lovely in another of MT's old gowns. I don't understand why she does not get her own with her resources but she does look good. Maxima is just a natural scene stealer--a force of nature with natural charisma, enhanced by red! Insult to stephanie. She is much taller and 6 times thinner than MT. She looks brilliant in this dress. Classic dress that will aleays look elegant and stylish. What a bizzare comment, Anna-Marie. I said Stephanie looks lovely and you say it's an insult. Very strange. Even though this dress is nice on Stephanie, I will continue to be puzzled as to why she does not find her own clothes with her resources. To me it looks just unbelievable that Stéphanie CAN wear them. They must have a person with very high sewing skills, who can adapt them. I think it is a plus for them to do it. Can I dare say the dress fits Stéphanie better than MT. Pine I see it as an insult to her. Due to the fact she is much taller ans slimmer than MT. Both of us agree on how beautiful she looks. This is to my opinion timeless garmen. If the dress is 14 years old so what. Princess Anne is also known as somebody who wears clothes over over again. Special care/treatment is taking to protect her clothes. Was MT SEEN IN THIS DRESS? Then I apologize for my opinion. I look at the royal ladies dresses if I like I comment if I dont I dont comment. People on the blog and thats not you will go crazy on dresses royal ladies are wearing but then different royal lady wil wear exactly the same style color and looked brilliant but is bashed. Pine dont get upset I was not attacking you or Diane referring to MT dress. Better Stephanie reuses MTs old couture clothes and looks fantastic in them, than buying her own new ones and not looking good in them. That said, nothing wrong in reusing good quality, well styled pieces that cost a fortune and still have lots of good wear in them. 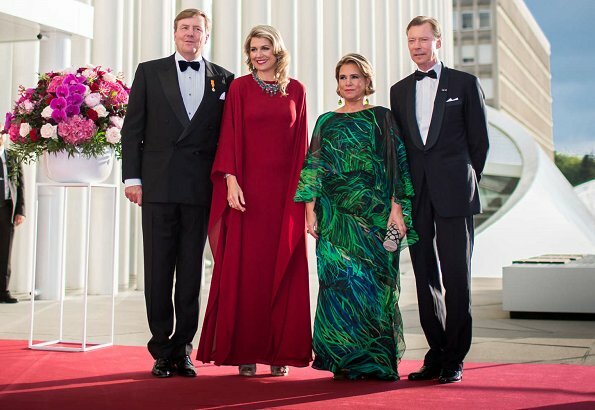 All 3 ladies look amazing, but Maxima... outstanding! If anyone can and should wear a kaftan and look like a million dollars, it's her. Her hair style is also fantastic and just right for the outfit and colour. Completely agree! I think that whether it was one of MT dresses or her own new dress Stephanie is still finding her footing. And make no mistake MT is drop dead gorgeous. She's aging in reverse and I love how she knows and wears what looks good on her and her body shape. But it takes a mature confident woman to know that. I think stephanie is still on a learning curve. 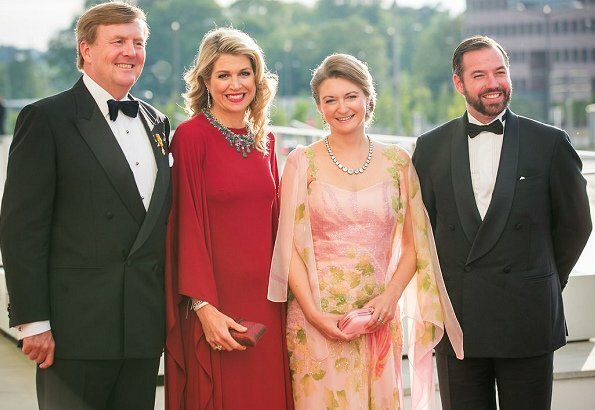 Maxima looks like a real beautiful choir singer. The ladies all look lovely. There just was a Danish conference on sustainability in fashion, so it is au courant to wear something previously seen. 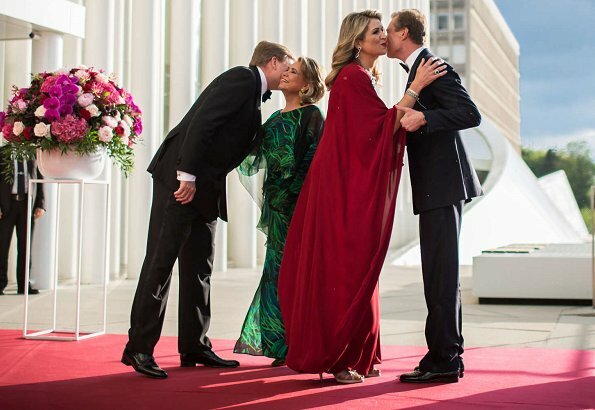 I think Royals have a responsibility to their taxpayers to find a balance between moving the fashion industry forward and moderation in the budget. Love the necklaces, too. Omg, Stephanie is breathtaking in this gown! Those colors make her glow, and that style of sleeve really flatters her (like the similar sleeves on yesterday's very successful green outfit). I want to see more like this -- doesn't matter to me if somebody else wore them previously, but as she learns what works for her, perhaps Stephanie will be more inclined to step out independently wrt fashion. Stephanie looks the best of all. The style is beautiful, not draped like a robe and not a wild print. Her dress is wonderful. Who cares if she borrowed it. Stephanie looks so lovely. Who cares what dress it is or how old it is, it suits her perfectly. Maria Theresia, Maxima and Stephanie, they are all looking very beautiful and stunning, they are glowing and shining in her own beauty. Their dresses are absolutly WOW and I like the so much. Maximas hair is goodlooking and Stephanies hairdo is perfekt for her. She has a sweet and lovely smile. Maria Theresia there is nothing to say, she always looks so stunning. Wow Stephanie!!! I knew it, you can wash the board if you like. Stephanie looks wonderful this time. Lovely soft colors, good jewelry and up-doe. 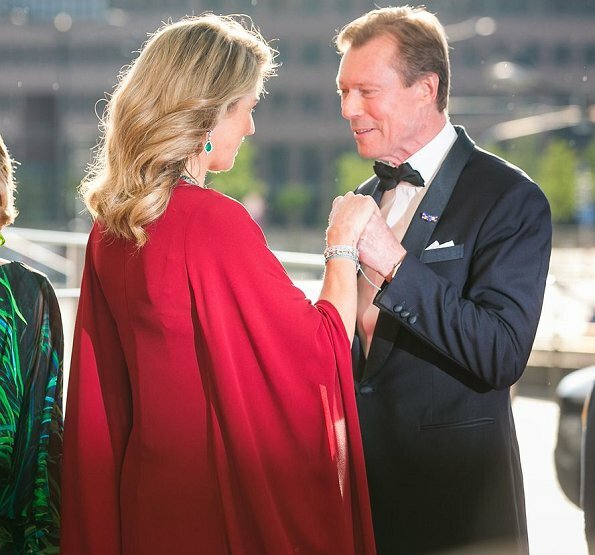 Marie Theresa looks good, about Maxima I am not sure do I like it or don´t I. Stunning, the ladies all look beautiful. But it is hard to beat Max when she brings her A game. She looks amazing. Oh le regard d'Henri à Maxima ! Marie Therese is always beautiful dressed. she looks great. I cannot understand why you like Stephanie so much in this dress. I think she looks like an much older woman and it is obvious that the dress is outdated, no sorry i cannot say anything positive about her clothing here. Re-Using and consciousness - we need to change our habits when it comes to clothing. So, I am tout d'accord with taking clothes from others. The colours of this dress are perfect for a blonde woman. What was a miss for the GD is now a good thing for Stephanie. Fashionwise Queen M in Red and the GD in futuristic Green look both just wonderful. Hi, I totally agree with you, Catch, why not wearing such dresses from MT? I think, they don't have the right size for MT any more, but they look very nice on Stephanie. Victoria does the same and wears dresses from her mom from time to time and I think it's good, the dresses weren't cheap and would be sad only to keep them in the cupboard or so. And it's definately good for the environment! MT looks nice in her green dress and Stephanie looks absolutly lovely! 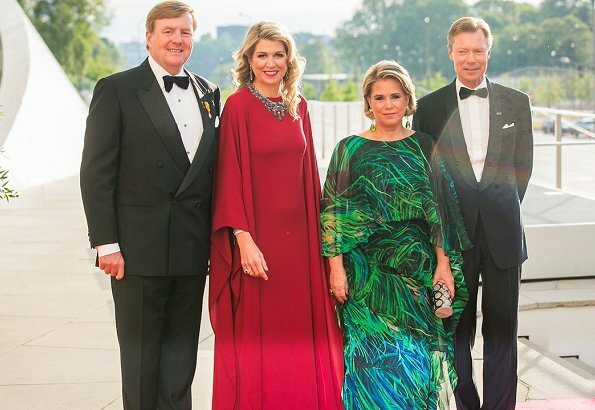 The Luxemburg and Dutch Royals really know how to celebrate.Maxima needs to wear more Valentino Stephany more Elie Saab I also liked the green outfit of Maria Teresa, who cares how old the dress is it sure looked nice. also the men we want to be fair here. Stephanie looks so pretty. 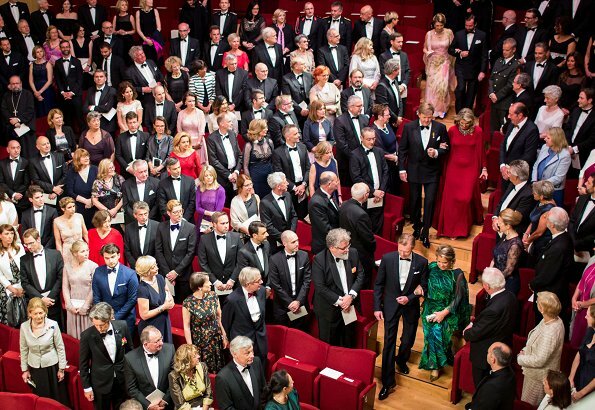 If I hadn't seen the photo, I would never have guessed it was one of MT's cast off gowns. I know they are very thrifty with clothing and hat in Luxembourg and this one is definitely a winner. 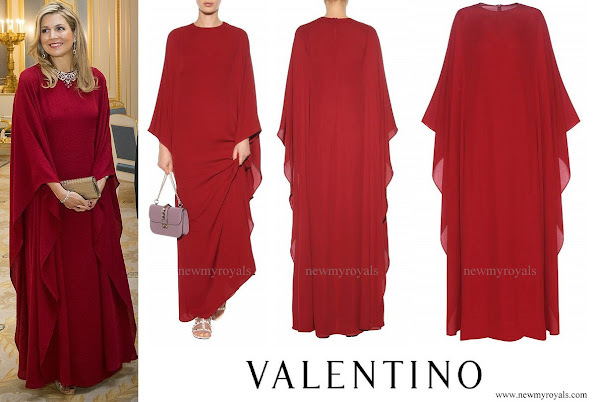 Maxima and MT looks lovely as well, although I preferred the first outing of Maxima in this Valentino gown, must be the accessories.